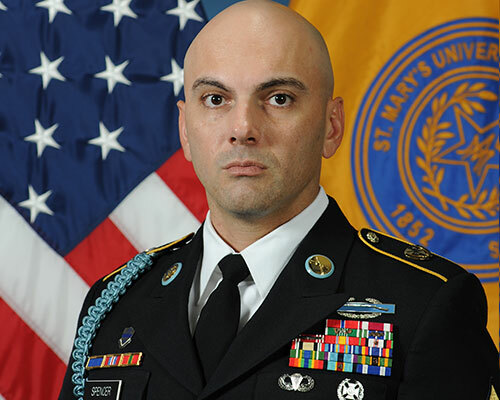 SFC Jaime Caballero Spencer was born in Odessa, Texas and graduated from Odessa High School. He enlisted in the Army in June of 1997 and completed One Station Unit training at Fort Benning, Georgia, where he was awarded the 11 Charlie MOS. Spencer has held a variety of duty positions including: Assistant Gunner, Gunner, Squad Leader, Section Leader, Platoon Sergeant, Personnel Security Detachment Leader, Forward Logistical Tactical Assault Command Platoon Sergeant and 11C Branch Manager. His Civilian and military schooling includes AA in General Studies, Warrior Leader’s Course, Advanced Leader’s Course, Senior Leader’s course, Mortar Leader’s Course, Emergency Medical Technician Course, Airborne School and Combat Life Saver. His awards and decorations include: Bronze Star Medal, Meritorious Service Medal, Army Commendation Medal with Valor (“V” device), Army Commendation Medal (one silver oak leaf cluster, one bronze oak leaf cluster), Army Achievement Medal (three oak leaf clusters), National Defense Service Medal, Iraq Campaign Medal, Afghanistan Campaign Medal, Global War on Terrorism Expeditionary Medal, Global War on Terrorism Service Medal, Non-commissioned Officer Development Ribbon (numeral three), Army Service Ribbon, Overseas Service Ribbon (fourth award), ISAF Nato Medal, Army Parachutist Badge, Combat Infantry Man’s Badge, Expert Infantry Man’s Badge and the Order of St Muarice. Spencer’s assignments include 1st Battalion 24th Infantry, Fort Lewis, Washington; 1st Battalion 506th Infantry (Curahee) Camp Greaves, Korea; 2nd Battalion 325th Parachute Infantry Regiment (White Falcon) Fort Bragg, North Carolina; 2nd Battalion 30th Infantry Regiment (Wild Boars) Fort Polk, Louisiana; 2nd Battalion 357th Infantry Fort Lewis, Washington; 2nd Battalion 3rd Infantry Fort Lewis, Washington; Human Resources Command, Fort Knox, Kentucky. He has deployed in support of Iraqi Freedom in 2003, and 2007 and in support of Operation Enduring Freedom in 2006 and 2011. He serves as Military Science Instructor at St Mary’s University and is responsible for the training and education of MS Is. He also maintain Cadre oversight of Rattler Battalion operations and is integral in planning, coordinating and resourcing Cadet and Cadre training.